This 4th of July I thought I’d share something I wrote a little while back about one of my DAR Patriot Ancestors – William Stewart. William Stewart was born in Scotland 23 June 1738. He came to Dutchess County with his mother Isabela (who died in 1793) and at least two brothers, James and Henry. He married 3 December 1771 in New York State Catherine Rowe, daughter of John Rowe and Catherine Lasher of North East Precinct, Dutchess County. 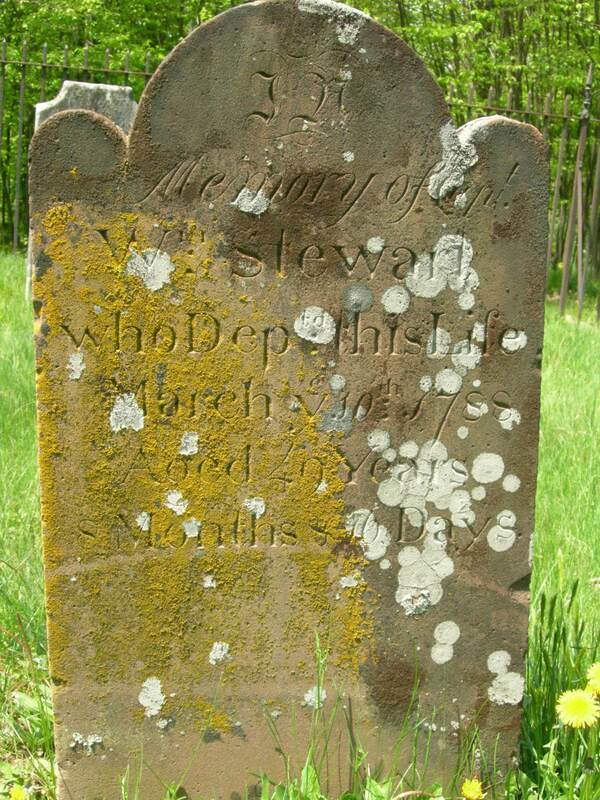 They had eight children, John Stewart 1773-a.1836, Catherine Stewart 1774-1848 who married William Hermans of Ulster County, Col. Henry W. 1776-1840 who married Phebe Sherrill, William W. 1778-1859 who married Elizabeth Pitcher, Isabella Stewart who married Dr. Uri Judd and removed to Yates County, James W. Stewart a.1782-p.1855, Richard deCantillon Stewart who married Tamer (last name unknown), and Andrew Stewart 1787-a.1836. According to deeds and mortgages, John, James, and Andrew may have removed to western New York State but no record of their descendants could be found. In 1836, William Stewart’s 83-year-old widow Catharine Rowe applied for a widow’s pension. Her younger brother Philip Rowe gave affidavit that his brother-in-law William Stewart (of the Town of North East, later Milan) “rode a famous black horse which commanded the admiration of the people… (and) kept said horse during the war and a little after it.” Another soldier from the same unit, Andrew Frazier also remembered this impressive horse in his deposition. Philip asserted that William Stewart was “particularly obnoxious to the Tories on whose detection and apprehension he was reputed to be uncommonly active and vigilant… a zealous Whig and efficient officer.” He was active in service as late as 1778 or 1779 and perhaps until 1781. He marched to West Point in 1776 with his brother-in-law Philip Rowe where they remained for several weeks. He was frequently absent from his family for most of the duration of the war. He died 10 March 1788 at 49 years, 8 months and 16 days. He is buried at what is now called the Rowe Ground on the western side of Rt. 199 in the Town of Milan across from the Methodist Church. His wife, some of his children, and his brother James rest close by. William and Catherine had three children (John, Catherine, and Henry) before the Battle of White Plains and five (William, Isabella, James, Richard, and Andrew) after it. The first and seventh were already dead in 1836. 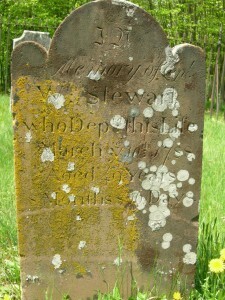 A William I. Stewart of Kings County, NY swore that all of William and Catherine’s children but their son James were dead by 12 July 1853. Catherine remembered marrying in February of 1772. She did not accompany her husband on any of his “military expeditions”. Four days after she died on 6 February 1844, Catherine Stewart’s pension was increased to $120. In 1855 it was increased to $180 to the benefit of William Stewarts only surviving child, James W. Stewart and in 1856 the service was accepted as being 12 total months and the sum was increased to $240. As shown in these documents, Catherine could not sign her own name. On 14 April 1775 a meeting was held in Charlotte Precinct (part of which became Pine Plains and Milan). There, Morris Graham, Robert R. Livingston, Jr. (aka Chancellor Livingston), and Egbert Benson were elected as delegates representing Rhinebeck, North East, Amenia, and Rumbout to the provincial congress to be held in New York City on 20 April. William Stewart and Morris Graham were the representatives from North East at that meeting. Shortly after this congress, news of the Battles of Lexington and Concord, the first military engagements of the Revolution fought on 19 April, arrived, and just after that, the first Articles of Association “a sort of pledge and protest against the government of England” were circulated for signing in New York. Many local men signed this pledge, including William Stewart, who with Nathaniel Mead, J. Simmons, and Frederick Ham reported the results for North East. Many who did not sign did so out of blind obedience to the King but also fear and uncertainty. William Stewart’s documents had been lost by the time his widow Catherine Rowe applied for a pension in the 1830’s. This made application difficult for her and she had to call upon many friends and relatives to give testimony for his service. This must have been incredibly frustrating for her, but gives those of us researching him a much bigger picture of what he did to further the cause of American freedom. From this pension and what records remain, we can paint a picture of a record of service that runs from the very first shots to the surrender of Cornwallis. On 10 September 1776, Col. Graham’s regiment of Dutchess County militia was recorded with William Stewart as Captain of the 6th Company and Hardenburg and Seaton, Lieutenants. A letter from Kings Bridge, 4 October 1776 from a General Heath to Captain William Stewart ordered him to “convey 2 suspect persons to Fishkill, leave to then go to Nine Partners to return to Kings Bridge on Wednesday next.” Andrew Frazier and John Smith gave testimony in Stewart’s widow’s pension that the tour of duty immediately following the Battle of White Plains (28 October 1776) in which and William Stewart acted as Captain was for a total of nine months. A Henry Soper also said in his own pension that he served under Captain Stewart for six months in the spring of 1776. Such assertions were important to increasing the sum that James W. Stewart received from his late mother’s widow’s pension. A letter of 2 January 1777 says that a “portion of the militia in Dutchess in Col. Graham’s regiment having refused on 30 Dec 1776 to march to the passes of the Highlands are to be compelled by force.” In May of 1777, Stewart participated in the court martial at Ft. Montgomery “probably for the trial of those who failed to serve as required.” When Stewart’s unit was reorganized on 18 March 1778 under Col. Morris Graham he was reappointed adjutant. The pension assumes that he held this position continually from his first appointment in 1775. The pension file of Everly Simmons declares that he served under Stewart and Morris Graham in 1780 or 1781 for three months. On 19 October 1781 British General Cornwallis surrendered at Yorktown. If the statements of the men who gave depositions in Catherine Stewart’s widow’s pension and others are true, William Stewart did indeed serve “during (the) greater part of (the) war”. Revolutionary War Widow’s Pension W.19104 especially pages 480 of 1104 regarding troop movements. Sara Spengler-Campanella on Who’s Newt, Anyway? Saartje on Who’s Newt, Anyway?